This is .12 Gauge Federal Blackcloud 3" 1 1/4oz #2 Steel Shot Ammo. 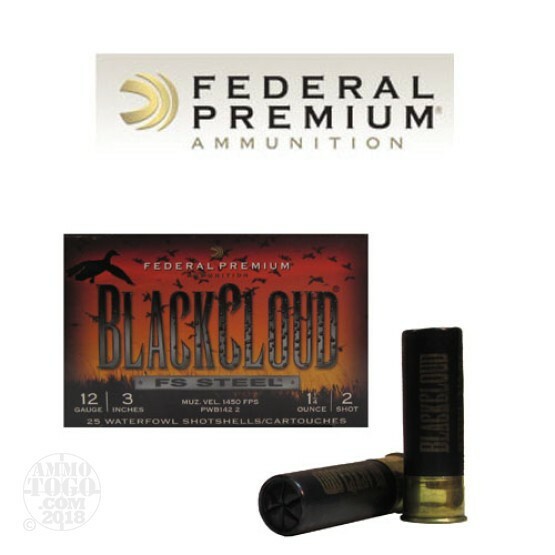 Federal designed the Black Cloud line of ammo with the duck hunter in mind. The proprietary FliteControl wad gets there faster and FliteStopper steel shot cuts on impact for more devastating penetration.Black Cloud uses a 40%-60% mixture of FliteStopper steel and Premium Steel shot to provide the most consistent pattern with the most stopping power on the market. Safe for all steel-rated barrels, Federal Black Cloud is the must have round for the serious waterfowl hunter. This ammo comes packed in 25rd. boxes, 10 boxes per case.